"Oh good, we're having pesto." That's what W said as he ran into the kitchen for a drink of water yesterday afternoon. He loves pesto and I made our first batch of this year yesterday. 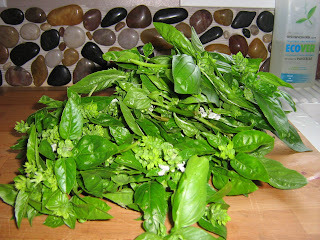 I just use basil ( I always plant loads), walnuts (we have two walnut trees and are always looking for ways to use walnuts up), olive oil, fresh lemon juice, garlic, salt and pepper. Those who want it add romano cheese. I froze the leftovers in little blobs so that I will have some to add to tomato, spinach and white bean soup, adding pesto makes the flavour of the soup incredible. We also had some green beans that I stir fried with tomatoes, onions and garlic. At the last minute I decided to add some Patak's curry and they were delicious. Of course we also had some zucchini (are you starting to see a pattern?) 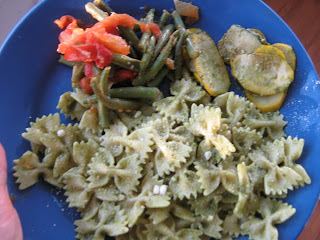 and, since there was some pesto love going on, I put some pesto on the zucchini as well. Yum!